Theft and repentance at a US National Park in photos. I adore this book. Italy is experiencing a surge in tourists returning purloined Pompeii parts, at least according to various news outfits. Why are these vandalizing visitors returning these Roman remains? A CURSE! The returners, most of them anonymous, write letters saying that the stolen artefacts have bought them bad luck. By righting their wrong they hope to free themselves from the curse of Pompeii. On my Twitter feed, archaeological reactions to this story were mixed. The people who commented on it lamented the continued use of the “ancient curse” trope which haunts our discipline… like a curse. An archaeological curse of archaeological curses. Thinking this through, however, I think it is wrong to dismiss this specific “curse”, a perceived curse on stolen objects, as a product of the pop idea of, I don’t know, a film about a re-awoken mummy coming to attack you in your sleep. I think the cause of the perceived curse is broader and far more interesting: an externalization of deep regret. Because of persistent feelings of guilt after theft, any setback experienced by the thief is interpreted as bad luck tied to the bad action. This is a petty criminal’s perceptions of their own criminality rather than pop ancient mysticism. The book Bad Luck, Hot Rocks supports this. I love this book. The Petrified Forest National Park in Arizona houses a 1200+ page archive of regret. 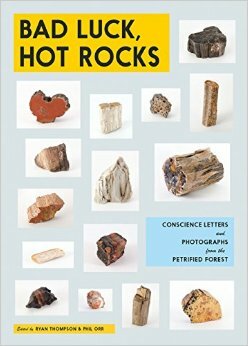 This is a collection of letters written by repentant park visitors who, for whatever reason, chose to illegally remove pieces of petrified wood from the park. 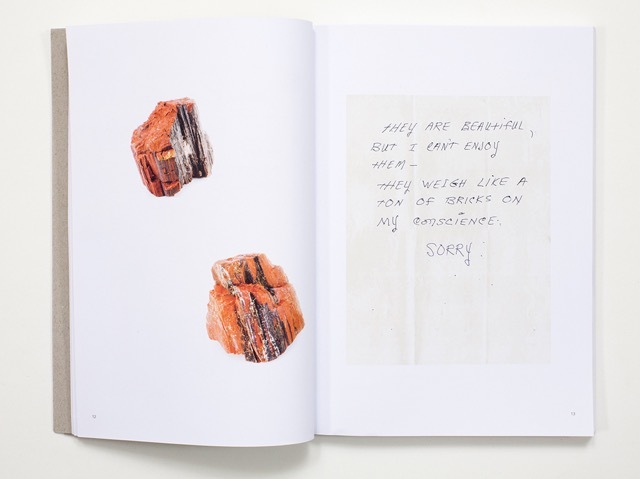 The letters, many of which were accompanied by the stolen rock themselves, express deep remorse and, quite consistently, report bad luck as a result of the theft. A curse. Gosh I am glad I own this book. You should own this book. Really. This idea of a curse on stolen objects extends past Pompeii, past the Petrified Forest: it seems to turn up nearly everywhere. I’ve recorded such stories in numerous locations in various contexts. 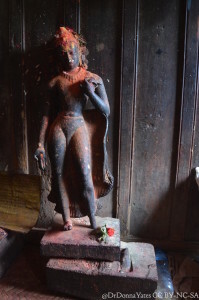 For example in July in the village of Sankhu, various people told my friend and I about a particular idol from the nearby Bajrayogini Temple. The story was that a man stole the idol but returned it not long afterwards saying that he was cursed because of the theft. 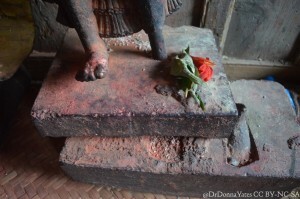 When we got to the Bajrayogini Temple, there was the returned idol! It had been damaged during the theft with one of its feet severed from the rest of it (see photos), but back it was, thanks to this perceived curse. Cursed idol returned to Bajrayogini Temple, Sankhu, Nepal. Damage caused during the theft. I’ve been told about curses on stolen church items in Latin America, on looted ancient things all over the place, and even (every once in a while) on fine art stolen from public collections. That on top of Pompeii and the petrified wood. These curses aren’t specifically ancient, rather they seem to relate to the act of taking something that is owned by no one and thus is a theft from everyone. Taking something public for private use. Hoarding beauty for yourself. The perception of bad luck as caused by theft of these objects also seems to relate to the ‘petty’ nature of the crime and that many of these acts are committed by people who otherwise would not steal. These are people who have no past experience coming to terms with such bad actions and thus are inclined to view normal misfortune as karma, punishment, or a curse. The return of the object, then, may not reduce the negative qualities of the person’s life, but it will no doubt relieve their persistent guilt and perhaps their perception of hard knocks forming a pattern. 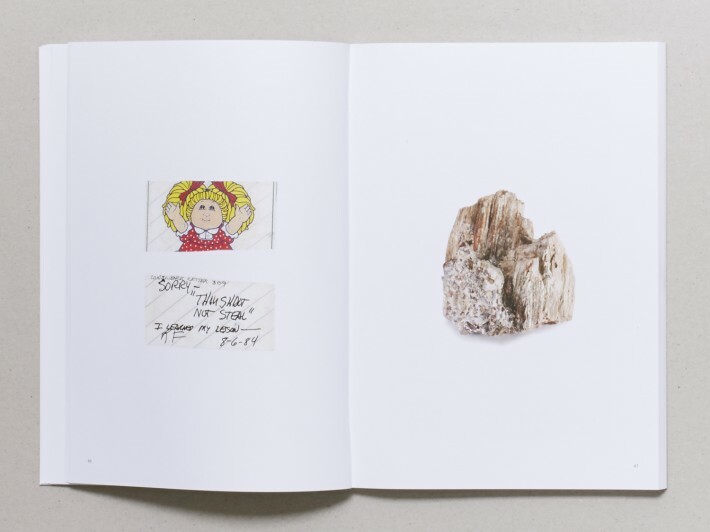 Coming back to the book, Bad Luck, Hot Rocks is wonderfully done, totally unique. 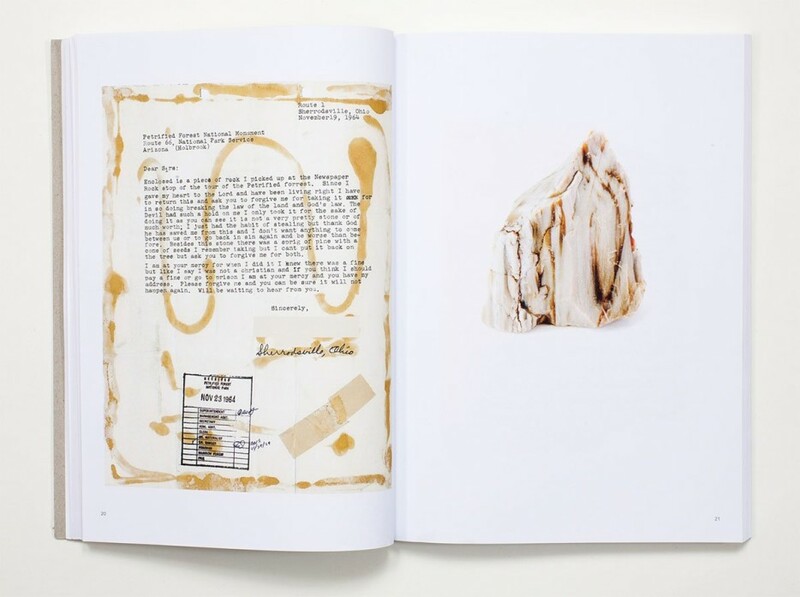 It is a book of expressed guilt and begged forgiveness from the hands of the petty thieves themselves. A must-buy not only for anyone working in the public heritage/ parks/ preservation/ museum sector, but also any of you criminologists out there studying criminality and feelings of guilt.